I first met Matt when I was living in Colorado in the early 2000's. An uber-psyched climber from the flatlands of Florida, Matt was psyched to climb anything and everything. At the time he was crushing the competition scene, but soon his love for the outdoors took over and he honed his trad climbing skills. With countless 5.13's under his belt, he went on to establish the first ascent of Iron Monkey (5.14) in Eldorado Canyon, and has free climbed El Cap via the Freerider route. Nowadays, Matt travels the globe most of the year. As a North Face athlete, he can be found in far off countries establishing new routes and having great adventures. He is also working on a beautiful mega project in Canada with fellow Metolius athlete Will Stanhope. Stay tuned for an interview with the boys after their trip up there this summer! You just got done with an amazing trip to the Verdon Gorge, how did you decide to take a trip there? I've heard about the Verdon for years and how it pretty much was the birthplace of modern sport climbing and I had to make the trip. 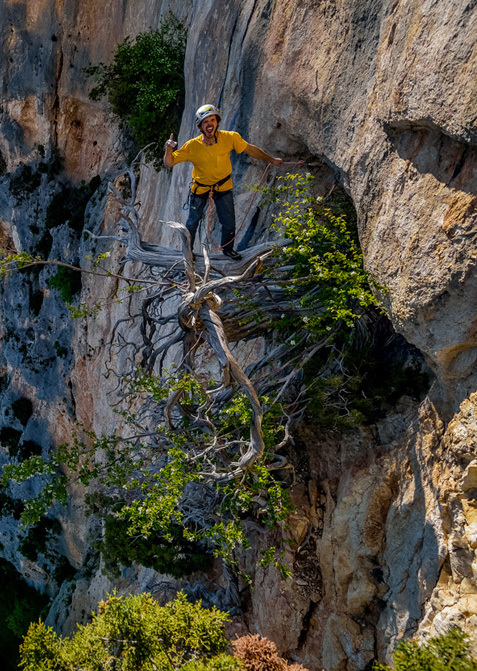 Over the years I've been fascinated with historical climbing destinations and the Verdon has always been high on that list. I teamed up with The North Face, National Geographic and 3 Strings Media for the trip an attempt to tell the Verdon's rich history and along with my climbing partner Emily Harrington to document the journey. It's such an iconic and historical place, why do you think it has fallen out of fashion? I think it has fallen out of fashion mostly because of the style. A lot of the routes in the gorge are extremely technical and slabby. I think there's been a push in the last 10 years to climb more overhanging rock. But what's crazy is there's a ton of that in the Verdon that not many people know about. Plus the technical climbing there is soooo fun!!!! It seems you travel a good part of each year, can you tell me a little about how you plan out your year in terms of climbing and travel? It's always a tough balance. The last few years I've revolved my schedule around being fit for the summer climbing season. So I'd give myself most of May and June to be home training. July and August have been spent on summer alpine rock climbing adventures. In recent years I've been focused on freeing a new line on Snowpatch Spire in the Bugaboos with Will Stanhope. Besides that, I try and go on 1 or 2 adventure trips a year. I just love exploring new areas and putting up first ascents. I know your background is like mine, and you started climbing in the gym. How much time do you spend training or in the gym these days? I still spend a good amount of time in the gym. Before I head out on a big trip I'm usually in the gym at least 2 days a week. It's just what I'm used to and somewhere deep down inside I think I actually enjoy training! How do you find that plays into your fitness for your climbing goals? I always try to balance time in the gym and time climbing outside. At the end of the day I enjoy climbing outside so much more, but I do find training in the gym helps me get fit for climbing outside. Can you tell me a little about the mega proj with Will? Oh man! Where to begin...It's the coolest, most amazing project I've ever had! Don't even think about stealing it :). Will and I both saw the line years ago and finally rallied to try it in 2012. It took us a whole season swinging around, "bandalooping" as we like to call it, to unleash the face climbing sequence which allows entrance into the amazing finger splitter. The splitter pitches make the whole effort worthwhile, and it's been an effort! In July we'll hike back in for the 3rd year in a row to attempt to finish it up. We've spent over 50 days on the wall and close to 4 months at Applebee Campground. BUT we're more psyched than ever! If you could set up your perfect day, in the perfect location, with the perfect partner, (climbing or not climbing) what would it be? Oh man! That's a hard one! Not sure but I'm usually satisfied with good friends and good stone! Favorite 3 pieces of Metolius gear? Super Chalk! - Best chalk in the world. The Gizmo Ledge - I've given mine the name Sugar, cause it's so sweet!